In this special show we’re unraveling the cold spooky truth of a shortwave number station. We will cover undercover agents, past and present number stations and the rise of Asian number stations. 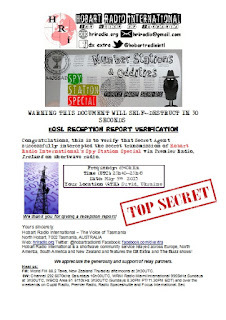 Hear this special Spy Station show this weekend on Channel 292 6070kHz Saturday 15/08 and Sunday 16/08 at 16h00UTC. Also on WRMI 9955kHz and WBCQ 5110khz Sundays at 3h30UTC. The "Koph" of Germany Jochen Schafer is our special producer for these two parts of the Spy Station Special. In his two shows he features rare recordings of number stations, specialising in German number stations. He also is a talented piano player. Impressive audio from a cassette recorder. These are from April 2005 and whilst accurate at the time some websites mentioned may no longer exist. Press the arrow (< >) on the player to hear the other track. 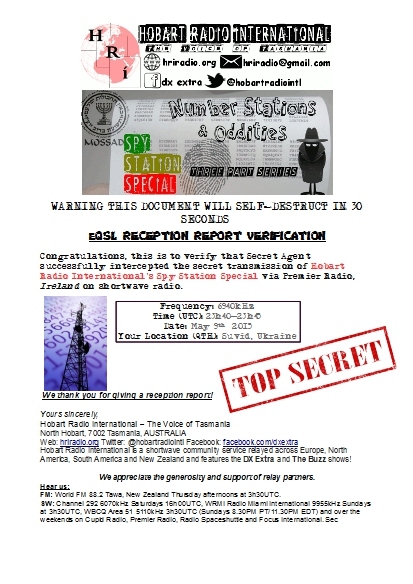 If you were lucky enough to intercept our transmission over shortwave via your own or web SDR radio we have a special spy edition eQSL just for you! We've been featured in the Bulgarian DX Blog and they've also added our schedule. "I really look forward to the next 2 parts online! I must admit I really enjoyed listening to it from start to finish it was very interesting and I learnt a lot about Asian number stations in particular." Jordan, Northern Ireland. "Good program about this subject. Was very interesting, especially the stations from China that you show at last." Claudio, Chile.